CENTRAL STATISTICS OFFICE statisticians have been seconded to the Department of Housing. In recent weeks, there has been confusion over the department’s calculation of the level of homeless and house builds in the country. Sources also state that the CSO could take over the responsibility of the collecting and publishing of Ireland’s homeless figures as early as next year. On Thursday, it was announced that the number of homeless people living in emergency accommodation in Ireland has dropped since last month, but the Department of Housing also announced that more people have been re-categorised out of the emergency accommodation figures. The Department of Housing recorded that there were 5,834 adults and 3,693 children in emergency accommodation during the recorded period last month – a total of 9,527 people. This represents a decrease of 190 adults and a decrease of 174 children. The department says the number of families affected has also decreased from 1,778 in July to 1,698 in August. However, it states that these figures follow the completion of an exercise to ensure the correct categorisation of emergency accommodation. Due to the confusion over the numbers, there have been calls for responsibility for the publication of homeless figures to be taken away from the Department of Housing and given to the CSO. Sinn Féin housing spokesperson Eoin Ó Broin is one of the voices calling for the work to be taken away from the Department of Housing and given to the CSO. “I will be requesting that the Housing Committee have an urgent meeting on this issue,” he added. Focus Ireland has also called on the government to clear up the latest confusion around the new figures. The charity said the Minister’s actions are fuelling the ongoing squabbling around the numbers, which distracts attention from the action that needs to be taken to end homelessness. “There is no other national statistics where this level of confusion would be tolerated,” Focus Ireland CEO Pat Dennigan said. The inability of the government to produce reliable and clear figures on the number of people who are homeless does not inspire confidence. In a statement to TheJournal.ie, the CSO said it is committed to working closely with the department “to address the challenges around the production of quality statistics”. This commitment includes progressing the secondment of statisticians from the CSO to the department. However, the CSO added that at present, the compilation of statistics on homeless persons remains the responsibility of the Department of Housing. It is understood staticians from the CSO have already been seconded to at least 12 departments. The Department of Housing has said it is being advised by the CSO on the development of a revised methodology for collection and publication of homelessness data. The CSO works closely with the Department on a range of statistical matters and would be available to provide advice on the measurement of homeless estimates if requested. However, sources state the collecting of figures by the Housing Department from all local authorities is a “tiresome process”, due to different classifications used by councils, and due to the back and forth contact between authorities. As first reported in TheJournal.ie, it was proposed that quarterly reporting of the figures was being considered, however, this was quickly slapped down. 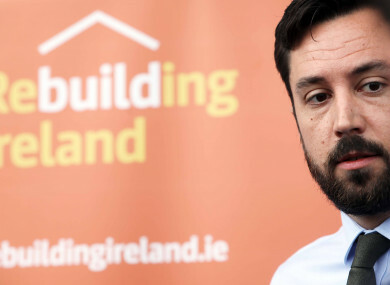 Housing Minister Eoghan Murphy said he wanted to have some consistency around the system of collecting the figures stating that some local authorities have sent inaccurate figures in the past, which the department had to verify and send back, causing undue delays. Senior government sources state that the minister is in favour of the CSO taking over the homeless figures calculations. While the department faced criticism about the homeless figures calculation, it has also faced similar attacks in June after new data revealed that over 30,000 fewer homes have been built in recent years than was previously reported. Since last year, the CSO and the department has been actively exploring how best to produce quality, objective and impartial statistics in relation to housing in Ireland. Both the CSO and the department recognise the importance and urgency of producing robust housing statistics for decision and policy making purposes. As a first step, a housing analytics group was convened in May last year by the department with active CSO participation. The group’s first report is due shortly. Email “CSO statisticians moving to housing department after confusion over homeless and housing figures”. Feedback on “CSO statisticians moving to housing department after confusion over homeless and housing figures”.